Prize-winning novelist, painter, blogger and photographer, Abha Dawesar has a full plate. 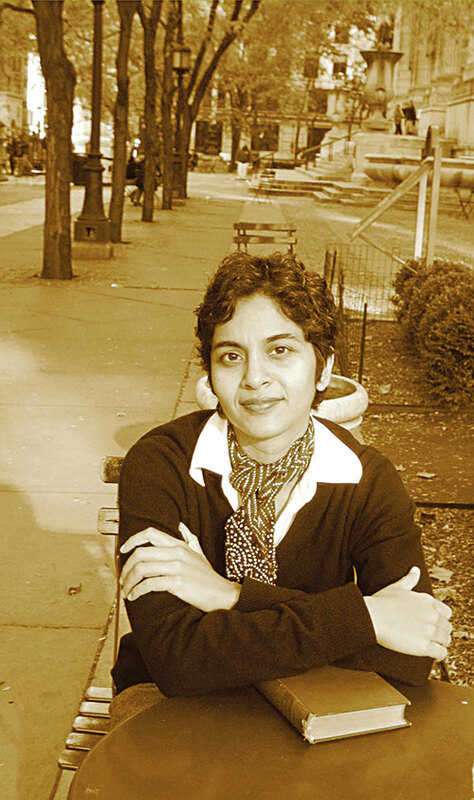 A Harvard university graduate, this Delhi-born-living-in-New York artiste is a woman of many talents, few qualms and a firm mind. Author of three novels, her latest book, That Summer in Paris ‘is as much about language and experience as about plot.’ Her photographs and paintings have been showcased in New York. Already acclaimed as a woman to watch out for, Dawesar is in conversation with Sitanshi Talati-Parikh on her take on home, varied careers and Indian writers in English. A degree in political philosophy, a job in finance and a career in the arts – how did all of these diverse choices come about? I left Delhi, to study in the US, knowing I wanted to pursue a humanities education, and the first time I stepped into a political theory class I knew that it was exactly what I’d always been looking for. After graduating I wanted to live in New York and decided in the end to work for a software company that specialised in financial software. Through all these different phases I was writing fiction but one doesn’t really choose to have a career in the arts in the same sense as one chooses other careers. One simply practices an art and then hopes it can become a career. Do you believe it is possible to write a novel on weekends alongside a full-time job, like your first novel? How does that affect the quality of work? It depends on the job and the novel. I think one can write and work full-time and the quality need not be affected. It might take longer to produce a work under such circumstances though in this particular instance it wasn’t the case with me. I think I’d find it very hard now to juggle a full-time job and write on weekends. Does the lack of a formal education in writing or art prove to be a deterrent in the production of the work of art or the saleability of it? I think it plays a similar role to an MBA, that is to say it helps acquire tools and techniques and develop a network. And while these are useful they aren’t entirely necessary. After a certain point it is not the education you’ve acquired but the freshness of your own ideas and your dedication that are important in the production of work. You use the photographic medium as a foundation for your writing, whilst also painting. How have you blended these three mediums in your artistic process? Writing and painting for me are responses to different impulses and very complementary. Sometimes there might be a formal correlation between the two but often there isn’t. While I’ve photographed and even had shows in the past, ever since I’ve gone digital, photography has become a way of keeping records—a visual diary of sorts. You have won a lot of awards for your writing – do you think awards help in making a writer more readable and interesting to the reader or in encouraging the writer? Writing is both a solitary activity and very isolating and I think for most writers, contact with readers is a satisfying experience. Awards are just an extension of this form of contact. A public discussion or acknowledgement of a work that was imagined and created in silence and isolation feels, in a way, as if the circle has been completed. Blogs are the latest communication space for thoughts. How does the forum help you form thoughts and do you feel that the sharing leads to productive ideas? Well, blogs give you an instantaneous readership if you desire. I tend to use my blog for quasi-essayistic explorations on art and film but it’s an ever-changing medium and if I start doing digital video tomorrow then I might even use it as a virtual screening room. The diaspora space is rapidly filling up – do you feel that the competition is increasing, as is the attention? From my perspective the diaspora space is not filling up, it is ever expanding! There is no reason there should be an intrinsic limit to this expansion. Competition is healthy in the arts just as in any other field and is likely to generate new voices and ideas; a very good thing. The attention given to this space is proportional to the role that India and Indians play in the larger world. A role that is both visible and important. Do you believe Indian writers abroad have an edge over those in India? They have a different role. All Indian writers who are abroad cannot be put in the same category. I think that 20 years ago they did get a lot more attention but the mobility of Indians in India has made a quantum leap in the past ten years. Despite the political developments and chasms of the post 9/11 world there is a general increase in accessibility to ideas and people across frontiers and over the Internet. Our old ways of using geography as an easy shorthand boundary for ideas is breaking down. Do you believe that living in a city like New York gives you the ability to freely express yourself and experiment with ideas, which could have been limited if you were residing in India? I would say that some 15 years ago when I first left India that would certainly have been the case. But the Indian arts scene, and I use that word in a broad sense, is now very exciting and open. For someone growing up in India now, the reasons to go and live abroad would be different than they were for me. It’s still good to see other modes of life but even without going anywhere there is an opportunity for experimentation and avenues for expressing oneself. How much of your background influences your work? My background affects my characters at times but a greater influence on my work is the background of the book I am writing. I am more interested in capturing the spirit of a place rather than its geographical setting though they two march hand in hand. I draw on the places where I feel comfortable, places I feel I can understand in a slightly deeper way. Born in Delhi, living in New York…which place do you call your home? I don’t really think in those terms. I need to feel in touch with India. I would hate to come back after a long gap and feel it had changed in my absence. The idea of settling down is not one that makes a lot of sense to me, I see myself being in the places where my books take me and see a sort of fluidity in the future.